It’s been awhile since I’ve done a movie release but we’re all about this one! 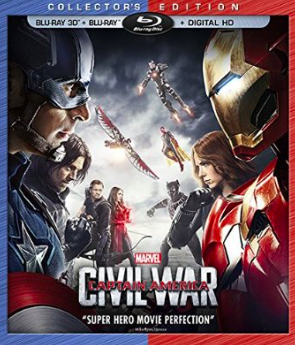 Captain America: Civil War will be released tomorrow on DVD (and digital). We saw it in the theater but I’m sure we’ll be watching it several times again as I’ve got a house full of Marvel fans. We like getting the combo packs too since they have the DVD player for the car and the digital download for the kiddo’s iPads. So, are you Team Cap or Team Iron Man?